12 experts. will be speaking. Starts at 9:00 AM. 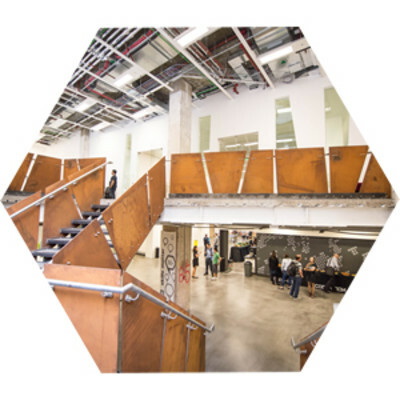 IBM Datapalooza Mashup London was a full day immersive experience for data engineering and data science practitioners. The event saw IBM and a diverse community of data professionals exploring inspirational data and analytics solutions using a variety of data sources including weather, transport, location, social and (as it was Wimbledon fortnight!) some tennis data. Some of the key questions covered at the Mashup were: Trying to figure out what to do with Internet of Things, machine learning and other emerging open technologies such as Spark and Quarks? Want to get your hands on the data and analytics products that you can use to build your own super-powered apps, gaining algorithmic inspiration from combining in-house data with insightful open data sources? Then this is the place to be! Whether you’ve been a data engineering or data science practitioner for years or just getting started, we are gathering experts from across IBM and our business partner community to bring you an amazing day of learning how to be a data innovator. DATAPALOOZA™ is a trademark of AcademyHealth and is used under license. Thank you for joining us at Datapalooza Mashup on 30 June! Datapalooza Mashup was a hands-on event using IBM's data and analytics services within IBM's Platform-as-a-Service (PaaS) Bluemix to mashup data from various sources, supported by our team of SMEs. There was development and deployment of simple applications using the IBM Bluemix platform, so a basic understanding of accessing and integrating data and analytics services through APIs would be advantageous. We will be providing access to tennis data from the 2014 and 2015 Championships. IBM has been the Official Information Technology supplier to the All England Lawn Tennis Club and The Championships for over 25 years, supporting its mission to be the premiere tennis tournament in the world. We do that by continuously innovating, by not being afraid to demonstrate how technology can add to the fan experience while never detracting from it. For speed of serve, to real time match statistics provided to commentators to mobile and digital solutions IBM helps bring The Championships to the world. The Weather Company will be providing historical weather data that corresponds to the tennis data above, plus access to live weather data on the day. TransportAPI will be providing access to transportation data from sources such as TfL. Ordnance Survey will be providing access to mapping data. After a short introduction to the day, we will be breaking into 3 streams, each of which will be repeated through the day so you have an opportunity to try each of them. Stream 1 - What happened? In this session we will be exploring techniques for capturing, storing and visualising historic data, using services that include Cloudant, Redis, Graph and Watson Analytics. Stream 2 - What is happening? In this session we will be exploring how real-time analytics can give insight from data sources such as social media and IoT devices, using services/APIs that include Watson, Insights for Weather, Insights for Twitter, TransportAPI and Ordnance Survey APIs. Stream 3 - What is going to happen? In this session we will be exploring the power of cognitive analytics, using services/APIs that include Watson and Alchemy. Refreshments will be provided throughout the day, including a light lunch that you can enjoy "on the go". Please bring your own laptop to the event to participate in the sessions. You will also need an IBM Bluemix account. If you do not already have an account, please register for one at ibm.biz/bluemixregnow (30 day free trial - so sign up in June!). 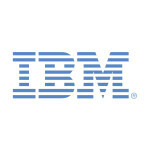 Simon and Ross will be joining the Datapalooza Mashup to support IBM Bluemix. Ross works with Independent Solution Vendors (ISVs), business partners, developers and startups to highlight the capabilities of the IBM Bluemix and Softlayer platforms as accelerators for product/offering development and delivery. He is building links between IBM, ISVs, Systems Integrators (SI) and Managed Service Providers (MSP) to expand the ecosystem that builds financially attractive line-of-business applications for our joint clients. Ross is currently recruiting partners to take offerings into the Energy and Utilities sector, around asset management, smart energy and water, and fieldforce enablement. Simon has been working with software vendors and startups in the "as a Service" market for 13 years. He specialises in infrastructure, platform and marketplace solutions, to enable new and existing business partners to access markets and sales opportunities through IBM channels, including the new IBM Digital Business. Simon provides business development support and enablement for partners wanting to get to market quickly, through prototyping and agilely developing their applications with a focus on revenue outcomes, including the API economy. He started in IBM as a CICS developer, and moved into channels management where he picked up responsibility for SaaS in Europe for IBM in the early 90s. Simon has a BSc in Mathematics and Computer Science, a Diploma in Strategic Market Management, and is a Project Management Practitioner. Rav will be joining the Datapalooza Mashup to introduce the new Data Scientist Workbench, and Darren will be showcasing some of the cognitive technologies being utilised at Wimbledon this year. Darren Shaw is a developer working for IBM’s Emerging Technology team. His background is in data analytics and visualisation. He led the development of a cross language social network for a US non-profit organisation and a gamification-based prototype for a UK online retailer. Darren leads the development of the cognitive and social media analytics tools for Wimbledon. Rav is a Senior Manager with IBM Canada specialising in Data Science and Big Data analytics. He is part of the Emerging Technologies team and is currently involved in incubating tools and services for Data Scientists. Rav also leads the work on client portals on Big Data University and founded ChannelDB2.com. He presents at events worldwide and has authored numerous papers, articles, books and courses on subjects in managing and analysing data. Rav holds B. Eng. from McGill University and MBA from University of Western Ontario. Dan will be joining the Datapalooza Mashup to demonstrate and explain the "Smarter Transport" application built on Bluemix. Dan is a software developer working in IBM Runtime Technologies. He enjoys prototyping innovative solutions for clients, both internally and externally at Hackathons. Dan has built a solution with Harry Wood from TransportAPI that provides congestion classification for London buses. Dan has also organised internal Hackathons for IBM, built a twitter controlled drone that made BBC news and recently won the RBS Hackathon in Edinburgh. Mike and Glynn will be joining the Datapalooza Mashup to support the IBM Cloud Data Services within Bluemix. Glynn started his career in the research and development arm of the UK steel industry, developing sensors and control & instrumentation systems. He then became a web developer creating search technology, CRM systems and automated telephony for a web-base business directory using a variety of relational and NoSQL technologies. He is now a Developer Advocate for IBM's Cloud Data Services. David will be joining the Datapalooza Mashup to support Bluemix from an IBM Business Partner perspective. I guess I’ve always been a tinkerer - always taking apart new technologies or learning new languages, trying to get something familiar to do something new. The development of micro sensors and the Internet of Things has enabled me to make my hobby my job. I was involved in some of the most interesting tech companies during the original dotcom boom, and after spending 12 years working for IBM, in 2013 I co-founded KnowNow Information. We provide data services to companies and cities around the world. Charlotte will be joining the Datapalooza Mashup to support the Data and Analytics services within Bluemix. Charlotte is a technical sales and solutions specialist working with clients across the UK and Europe on Big Data platforms including hadoop, data warehousing, analytics, managed services and streaming analytics. Charlotte works with on-premises, cloud and hybrid solutions. Harry will be joining the Datapalooza Mashup to support anyone exploring TransportAPI. Harry Wood is Transport API’s Software Engineer, and has lead much of the software development that brings Transport API to life. He works on wrangling open transport data to bring it into the system, via bulk imports and live feeds. He has also built web and mobile apps as demonstrators of the API, or as bespoke projects for customers., also specialising in web maps and geo-data. In his spare time he is very involved in the OpenStreetMap project, a collaborative project to map the world. Previously he worked as a enterprise middleware consultant for clients in finance, telecoms, engineering and local government. Matt will be joining the Datapalooza Mashup to support the Ordnance Survey APIs. Working within Ordnance Survey as the Technical Product Manager of APIs, helping to shape and create industry leading APIs, create front-end framework and driving forward unified API practices and framework throughout the company for all publically facing APIs. Yacine will be joining the Datapalooza Mashup to support the IBM Watson services within Bluemix. Smarter Travel is an example of 3 data services and value add functions being brought together into an integrated solution using the power of Bluemix. By using the agile development capabilities of Bluemix, and using the APIs made available by each service, the solution was developed in less than 20 hours - in what is the equivalent to a £200,000 systems integration project. This is because Bluemix provides a platform that removes the overhead of setting up the underlying infrastructure, runtimes and scaling needed for applications, and through the development allows quick repeat of provisioning, deprovisioning required for agile development. 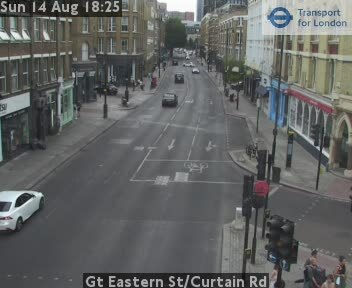 Smarter Travel is available at http://bus.eu-gb.mybluemix.net - choose operator "London Buses" and Route 88 and click on a camera! 2. CCTV images of junctions - example. 3. 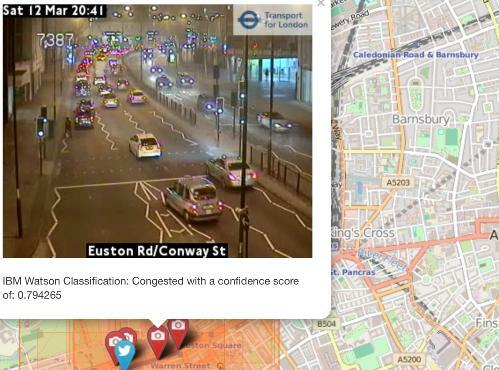 Watson Visual Recognition - https://www.ibm.com/smarterplanet/us/en/ibmwatson/developercloud/visual-recognition.html - Watson was trained with 10 photograpss of a congested road, and 10 of an uncongested road, which enables it to analyse the CCTV images and classify them. You can read more about the Smarter Travel project at: http://www.transportapi.com/smarter-travel-transporthack/. Codenode is the home of our monthly Datapalooza Nights - a series of meetups for the Data Science community. Many other communities meet at Codenode to discover emerging technologies and explore ideas related to Data Science, Data Analytics and Machine Learning - so we could not think of a better venue to bring the Datapalooza community together! Datapalooza Meetups take place at CodeNode on the 4th Thursday of each month. See here for details of future events, and here for recordings of previous events.